Weekly JOURNEY gives you news and current affairs from Japan and the UK. Covering such topics as politics, the economy, social affairs, entertainment and sport, Weekly JOURNEY is full of the latest “hot” news, gossip and headlines with pictures. Featured also are topical issues in Britain, restaurant reviews and recipes, a calendar of events and holiday ideas, proving Weekly JOURNEY to be a valuable reference guide for residents of and visitors to the UK. Readers will also be able to tune in to local services with our weekly London TV Guide in Japanese and a Classified Advertisement section second to none. ◆Weekly Journey is posted 1st class Wednesdays to arrive Thursday mornings to UK subscribers and other outlets outside our delivery area. 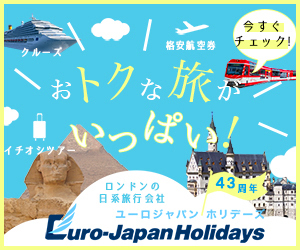 ◆Weekly Journey is free. It is distributed to 270 outlets, mainly in central London, every Thursday morning. Pick-up points are Japanese supermarkets, hairdressers, restaurants, etc. ◆Weekly Journey is distributed as a complimentary copy every Thursday to offices ordering Japanese Bento lunchboxes.